The life of a criminal barrister is one of high stress, sweat-inducing responsibility, poor pay, unbeatable camaraderie and extremely funny stories. I have often thought that the “life-and-death” issues in which barristers deal – like police officers, surgeons and firemen – make humour an essential coping tool. I was a pupil barrister in the Chambers of Robert Flach QC, in the Middle Temple, of whom hilarious stories are legion – but this guest blog is not about him. It is about two very green barristers, your writer and a man who was to become a close friend, whom I shall call Derek. We were both about 23 years of age and pupils to an up-and-coming criminal barrister, hereinafter referred to as “Mr Smith”, who was at that time being led by an eminent QC in a high-profile criminal trial at the Old Bailey. Mr Smith had left us to do some paperwork while he was in court that day and we were, as always, floundering around a mountainous pile of papers involving arcane and unfamiliar concepts, nattering away and finding every available excuse not to deepen our knowledge of the Law. Then the telephone rang. It was our senior clerk. Mr Smith had left behind some important documents, and one of us needed to run the papers down to Court 2 at the Old Bailey immediately. Enormous excitement – this would be the first time that we had actually been in the legendary Central Criminal Court. Did we need to be robed? Mr Smith didn’t say, replied the clerk, but better safe than sorry. So we changed our Windsor collars for brand-new wing collars, pushing the brass and mother-of-pearl collar studs through the buttonholes closed with dried starch, tied our bands (those white things worn also by vicars) pulled on our gowns, and grabbed our wigs. Then we looked for the papers on Mr Smith’s desk and found what amounted only to two short Statements, no more than ten pages. So, only one of us was needed to make the delivery. ‘Toss for it,’ I offered. ‘Fair enough,’ agreed Derek. I won. ‘Best-of-three?’ suggested Derek. Like an idiot, I agreed. He won the next two. ‘No time,’ he said, looking at his watch, and off he scuttled, wig in one hand, statements in the other and black gown billowing behind him. I followed; having changed into my fancy dress, there was no way I was going to miss the adventure. It took us little more than five minutes to jog down Fleet Street, over Ludgate Circus and left into Old Bailey. We paused outside the heavy swing doors of Court No 2 and Derek placed his wig on his red Irish hair. Inside we could see the tall wooden dock in which sat our pupil master’s clients, the raked banks of jurors, the massed ranks of reporters and the packed gallery. The back of the prosecution QC could be seen as he addressed the Recorder of London, who sat robed in black and purple, higher than everyone else in the court, under an enormous pediment bearing the crest and the words “Dieu et mon droit”. ‘How do I look?’ whispered Derek. ‘Okay. Here we go.’ He took a deep breath and reached for the door. ‘Don’t forget to bow,’ I reminded him. He turned back to me, his face slightly pale. ‘Right, thanks,’ and he pushed open the door. The door made a loud squeak just as, unfortunately, there was complete silence in court. The jurors turned at the noise, followed by the members of the press. Derek’s progress down the centre aisle towards the barristers’ benches at the front of the court was followed by forty pairs of eyes. The prosecution barrister began speaking again but realised that the attention of everyone in the court was on something going on behind him. He turned, and every other barrister on the benches followed suit. Within a few seconds Derek was the centre of attention of everyone in the court. 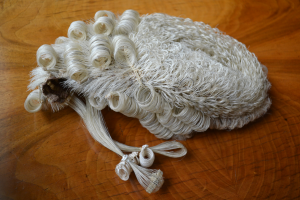 Blushing as red as the hair emerging from under his wig, Derek located Mr Smith in the second row amongst all the other identically-dressed barristers. He walked along the front of the row and handed our pupil master the Additional Statements. He then turned and, apparently remembering my last comment, bowed to the judge. He bowed to the ranks of barristers. He bowed towards the dock, causing the jurors to giggle. Hearing the noise he then made a quarter turn, and bowed to the jury, causing the giggle to become a ripple of laughter. He then backed back up the aisle – bowing once more to a surprised court usher holding a water jug – felt behind him for a door, opened it, and stepped backwards – into the exhibit cupboard, closing the door behind him. Everyone in the court knew that poor Derek was now standing in complete darkness surrounded by boxes of exhibits, and they waited to see if he would emerge again. Like the rumbling of distant thunder, the laughter grew until it became a crescendo of hilarity ringing around the court. After about thirty seconds of what must have been complete torture to Derek, but during which he was utterly immobilised by embarrassment, the Recorder of London took pity on him. ‘For heaven’s sake, usher, let the poor fellow out,’ he directed. The usher put the jug on a bench and walked up the aisle. She opened the door to be greeted by a mortified pupil barrister standing in the dark. Derek stepped into the court to an eruption of wild applause. He cast about himself, saw me furiously beckoning from outside, and ran to the safety of the corridor. I’m delighted to tell you that despite this setback, Derek enjoyed an extremely successful career at the Bar, but perhaps unsurprisingly he forsook practice at the Old Bailey, opting instead for the quieter life of a civil practitioner, toiling through mountains of papers, but safe from the ridicule of any jury.